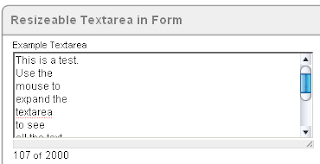 Some time ago there was an interesting posting on the OTN forum about integrating resizeable textareas into APEX (especially into the Application Builder). I thought that is a nice and useful feature, so I adapted it a little bit and integrated it into the new release of the ApexLib Framework. Check it out on the ApexLib Feature Demonstration page. How to use it in your application?